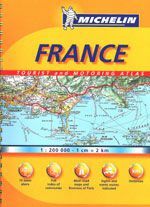 Road atlas of France...at a scale of 1:200,000 it has everything you need! All types of roads, towns (with an index in the back), a distance chart, gas stations, some bike paths, parks, viewpoints, lighthouses, airports, shaded relief, and a section of city maps in the back. 462 pages, spiralbound.